If you want to gain weight in a healthy way (or even lose weight), then eating healthy fats is a must. One of the sources of these are avocados. You can eat avocados in different ways, either fresh straight up or you can add them to a wide variety of salads if you want. You can even mix them up in a mixer and drink them, maybe adding them to other fruits and making a refreshing drink for yourself. Avocados contain all kinds of good stuff: fiber, vitamins A, B, C, E, K, and minerals such as phosphorus, potassium, zinc, magnesium, iron and manganese. Above all however, the avocado is known as a prime source of healthy fats. An average full avocado contains around 300 calories. 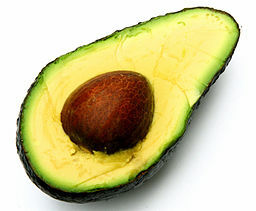 For an avocado that weighs around 200 grams, 30 grams out of that would be made up of fats. Monounsaturated fats (healthy fats) account for 63% of this, polyunsaturated fats for around 20% and saturated fats for 17%. Monounsaturated and polyunsaturated fats actually lower blood cholesterol levels and promote a healthy functioning of the heart. So why are avocados good for weight gain? They contain around 300 calories and even if you eat just one, that is a significant amount. Furthermore, they promote a healthy lean weight gain, as it actually lowers bad cholesterol levels. If you want to gain weight, then avocados are a natural choice to help you do that.